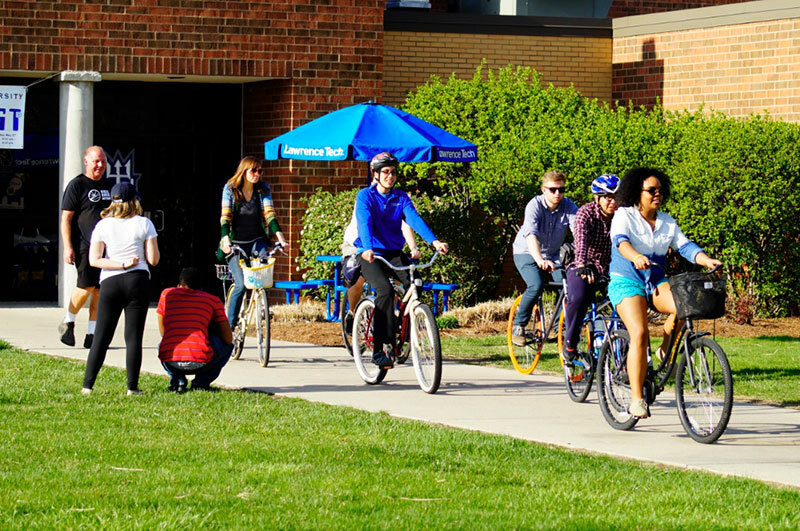 The League of American Bicyclists has recognized Lawrence Technological University with a bronze Bicycle Friendly University award. Lawrence Tech is the only university in the tri-county Detroit area with the designation, which is good for four years. The league named 51 new and renewing BFUs in 25 states this week. The organization has now named a total of 164 BFUs in 44 states and Washington, D.C. “We applaud this round of BFUs for raising the standard and being innovative in making bicycling a safe, convenient and enjoyable option for students, staff and visitors alike,” said Bill Nesper, program director for the league. In recent years, Lawrence Tech has added bike lanes, bicycle signage, and bicycle racks around campus, including at new buildings like the A Alfred Taubman Engineering, Architecture, and Life Sciences Complex, and at the university’s new outdoor athletic field. Lawrence Tech also provides a free bicycle repair station and bicycle pumps at its Don Ridler Field House, and offers free winter bicycle storage to students. The university’s campus safety department has also been trained in bicycle safety, and the university’s Tech Transit student transportation system is now bicycle-friendly. “We have more and more students living on campus now, and becoming more bicycle-friendly is part of the ongoing physical transformation of a commuter campus into a residential campus,” said Philip Lucas, Lawrence Tech student engagement coordinator. With the BFU designation, Lawrence Tech will have access to tools and technical assistance from the league to become even more bicycle-friendly. To apply or learn more about the BFU program, visit www.bikeleague.org/university. The league also offers Bicycle Friendly Community, Bicycle Friendly State and Bicycle Friendly Business programs. Lawrence Tech joins Aquinas College, Grand Valley State University, Michigan State University, Michigan Technological University, the University of Michigan-Ann Arbor, and the University of Michigan-Flint, as having the designation in Michigan.